T. fedtschenkoi Ronniger in Feddes Rep. 31:139 (1932). var. handelii (Ronniger) Jalas in Ann. Bot. Fennici 17:321 (1980). Syn: T. kotschyanus Boiss. & Hohen. var. handelii Ronniger in Feddes Rep. 31:138 (1932)! Similar to T. migricus but smaller in all its parts. Flowering stems 2-4 cm, shortly patent-pubescent. Leaves c. 5 x 2-3.5 mm (incl. 1-1.5 mm petiole), oblong-ovate to orbicular-ovate, shortly pubescent, with usually 2 pairs of prominent lateral veins joining to form a marginal thickening; oil dots reddish. Inflorescence weakly differentiated from vegetative shoot, with few-flowered verticillasters and leaf-like bracts. Bracteoles c. 1 mm, pedicels 1-2 mm. Calyx 3-3.7 mm, campanulate, upper lip equalling lower or somewhat shorter, upper teeth 0.3-0.5 mm, with 1-celled scabrous projections. Corolla pale, to 5 mm. Fl. 8. Stony mountain slopes, 2340-3100 m.
Type: [Turkey B8 Siirt] Kurdistania media Mt. Meleto (Meretuğ) Da., 2900-3100 m, Handel-Mazzetti 2754 (lecto. W!). - Some of the Caucasian and N.W. Iranian syntypes certainly do not belong here. E. Anatolia. B9 Van: Hoşap to Başkale, Çuh pass, 2340 m, Hub.-Mor. 13269! Bitlis: Nimrud (Nemrut) Da., B. Post 902! B10 Ağri: Doğubayazit, Hama Da., c. 3000 m, T. Baytop (ISTE 4869)! Endemic. Ir.-Tur. element. The type variety, with glabrous leaves, is from Transcaucasia. 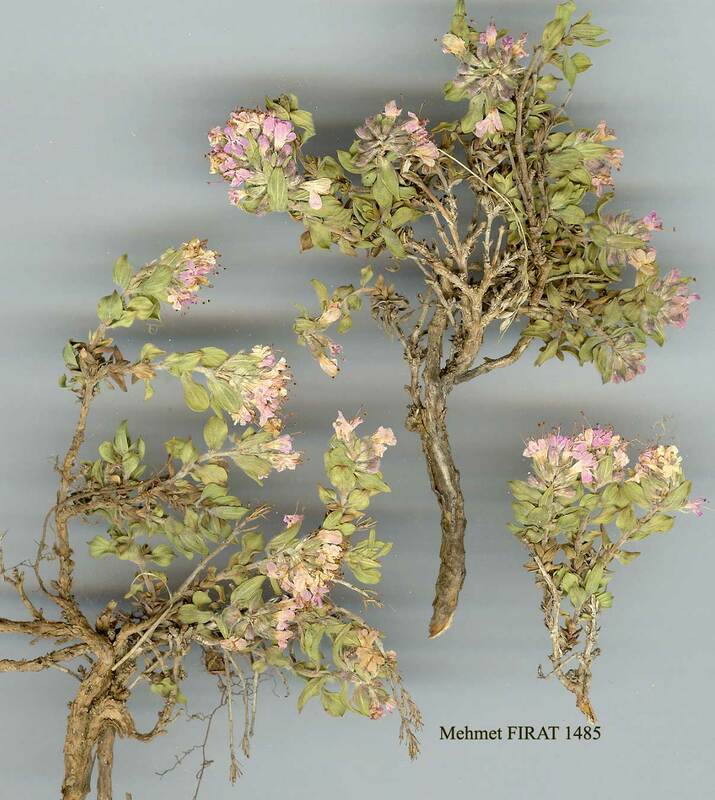 The identity of a plant from B10 Ağri: (3 km E. of Doğubayazit, 1750 m, D. 43939!) is unclear. The leaves are similar to those of T. fedtschenkoi, glabrous or hairy, but the inflorescence is radically different, being up to 5 cm, interrupted, with c. 5-flowered pedunculate cymes in axils of leaf-like bracts, and calyx only 2.4-2.8 mm. It looks almost like a Micromeria.